A Chinese official in charge of regulating the Internet said Beijing must strengthen Internet security because “overseas hostile forces" are using the Internet to “attack, slander and spread rumors". 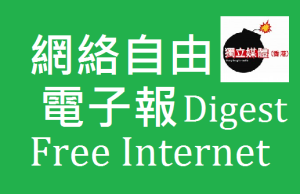 Apple Daily a very popular daily news website with a strong anti-China stance was hit by a massive Distributed Denial of Service (DDoS) attack in Mid June, as well as a voting site. Terms related to Tiananmen massacre were censored on internet, China even blocked Google to silence the discussion. 歐洲：人有被遺忘的權利？｜Europe: Right to be forgotten? A top EU court has ruled Google must amend some search results at the request of ordinary people in a test of the so-called “right to be forgotten". It is the first time a Singapore blogger has been sued for libel by prime minister Lee Hsieng Loong.